Al Peasland (5th Dan with the British Combat Association, 3rd Dan Traditional Karate and internationally renowned teacher) wrote an interesting article on “Back To Basics”. In this article he compares an experience he had learning to ski with how he teaches self protection. He spent most of the time learning how to do “the plough” (position where the front of the skis point inwards, forming a triangular plough shape). Al asked why they spend so much time in the plough position when it is not the way that they do “real skiing”. The instructor explained that practicing the plough gives you control over the snow, when you have that, the rest of the fancy stuff can be mastered. But without control over over the snow, the ability to ski fast, turn and (most importantly) to be able to stop; will be very difficult to learn. When you see a good skier whizzing down a slop, skis parallel, twisting and turning around obstacles, you don’t see the plough. Yet without learning the plough first, you would not see the speed and agility. So (as Al explains) it is with martial arts and self protection. Without learning the basic stances, basic techniques and sparring/drilling routines, you would not have a very a structure that you could use under pressure. Although I am a further down the martial arts food chain than Al, I agree entirely. People often talk of “muscle memory”. However, muscles don’t have memory, only the brain does. When you do a movement, any movement, or even a particular behaviour pattern, you fire a series of tiny electrical signals across the brain. These are the parts of the brain that control that movement or behaviour. When you repeat a movement over and over, those tiny electrical signals get stronger and the brain forms more links inside to carry the stronger signals. This is called a “neural pathway” through the brain. It is here, rather than the muscle that the memory of movement is stored. The more we practice a movement over and over again, the stronger and bigger that neural pathway becomes, until eventually we no longer have to put in any conscious thought, we just fire the neural pathway and instinct takes over. This is what we want when under pressure. We want such strong, deeply rooted neural pathways, that we don’t need to think about how to punch/strike/kick etc. We just want to be able to think this is it, action, and the rest just happens automatically. The main difference between a master and a beginner is not necessarily their strength or physical prowess, it is the strength of these neural pathways, forged by years and years of repetition. People often look for the quick fix (which is human nature). Partly for that reason, pressure point fighting has become popular over recent years. However, as I’ve said before, if you don’t know how to hit, if you can’t move with speed and accuracy, you will not be able to strike pressure point targets effectively. Whatever your style of martial art, practice basics, basics then some more basics. It is the only way to really be able to perform under pressure. I promote the use of practical bunkai on this blog, but without good basics you will struggle to make them work. I liken it to the foundations of a building. The first thing the builders do is to dig a bloody great hole and fill it in with ugly cement and steel. When the nice new shiny building is finished, you don’t see those foundations, you don’t see that hole and cement. You only see the building on top. But without that cement filled hole, the building would easily collapse. So it is when you see a great fighter performing great athletic feats, breaking boards, fancy jumping kicks or annihilating an opponent. You don’t see the years that the same fighter spent in a basic stance practicing a basic technique over and over again until he/she had a really deep foundation and incredibly strong neural pathways. And let face it, if it was easy to learn in a few weeks, then all the muggers and predators would have done it to, so they would know what we know. What sets us aside as martial artists is that we take the time to study and to evolve. And in so doing we not only become better able to defend ourselves, but we become better human beings in the process. Here’s a video where Keith takes the lead for a change (gives me a break) 🙂 Although Keith practices more Choy Lee Fut these days, his base style always used to be Wing Chun (which I trained with him for a while). One of Wing Chun’s characteristics is its very fast multiple attacks, or as one instructor puts it; “be all over them like a rash”. This is an effective fighting method. However, during his time teaching, Keith noticed that sometimes people get a bit too focused on the rapid multiple attacks and forget to put in any real power into their techniques or to aim for good finishing targets. This is not a criticism of Wing Chun, it’s just a mistake that sometimes people fall into. Although emphasising fast close quarters techniques, Wing Chun practitioners can still develop a lot of power and finish fights very quickly, which is especially important with multiple opponents. You don’t want to be caught hitting somebody 20 times, whilst their mates are trying to hit you too. So in the following video, Keith reminds people of ways to use Wing Chun to finish a fight very quickly by being selective in your targets, rather then getting drawn into hitting them too many times, which sometimes ends up becoming very “slappy”. 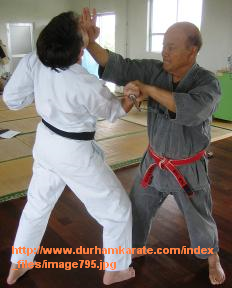 The kata’s (patterns/forms) within a traditional style often have different salutations and ready positions. This would indicate that they have different meanings, beyond being just a salutation. Think about it, if they were no more than just a salutation, why would they not be standardised. Why would any style need more than one salutation which it would use on all of its kata’s/patterns/forms. Logic would suggest that these salutations/ready positions are moves that could stop an opponent early in the proceedings, before a full blown fight breaks out. If that does not work, then its into the kata to use techniques that will deal with a full blown fight. The most common salutation or ready position in Karate is the “Yoi”. The performance of the Yoi may vary from style to style, but generally the arms come up to head height (sometimes higher) then circle inwards and downwards, crossing over your center line, then back outwards, before settling just about hip height at about a torso width apart. Here’s our interpretation of how to use the humble Yoi against somebody who is acting aggressively, to turn the tables on them and put them in a position of disadvantage which you can exploit as you see fit. Please tell us what you think. Is your Yoi or salutation very much different? Do you see the Yoi as being no more than a salutation with no practical function, or do you see it as a functional movement as we do? Feel free to leave your opinion in the comment box below. Following on from our last video on bunkai from the kata Nijushiho, Keith takes the lead and we take a look at similar applications from Wing Chun’s second form, Chum Kiu. WOW! An Endorsment By Geoff Thompson! Geoff Thompson is co-founder of the British Combat Association and a pioneer for reality based martial arts training. His experiences as a martial artist (now 6th Dan) and working as a bouncer gave him a great insight into what does and does not really work when under pressure. He put this experience into his own teachings and was polled as the number one self defence instructor in the world by Black Belt magazine USA. From there he has become the author of thirty-four books, five multi-award-winning films (two BAFTA nominated, one BAFTA winning), two stage plays and hundreds of published articles. “Shotokan has always been my base system, so it was fascinating for me to watch the Charlie Wildish DVD on Bassai Dai, and come away with so much new information about this powerful kata and its origins. I particularly like the historical element about Sokon Matsumura (who created the kata) and how, when & why he created the “grappling kata”. I got a lot from this DVD and highly recommend it”. “I thought your kicking DVD was very good too. You presented well and the info was strong”. I’ll be honest, I was also given a few tips on improving presentation, which I was very grateful for and which I will be looking to implement as soon as I can. To find out more about Inside Bassai Dai and 10 Kicking Tips, or to buy them, please visit our on-line Store. Posted in Bunkai, DVD's / Books, Karate, Kung Fu, ReviewsTagged bassai dai, british combat association, bunkai, dvd, geoff thompson, improve kicking, inside bassai dai, kicking tips2 Comments on WOW! An Endorsment By Geoff Thompson! Here we look at the opening sequence of the kata Nijushiho (also known as Niseishi). In Shotokan in particular the usual interprutation of the slow forward moving “elbow strike” is that it applies an armlock under the opponents elbow by applying upward pressure. However, it seems to work much better if you apply the armlock across your chest. Have a look at the video and see what we mean.